The same research team in collaboration with Prof Peter TÖRÖK from ICL has also developed a technique using Brillouin microscopy to probe the mechanical properties of biofilms at the micrometre scale level. 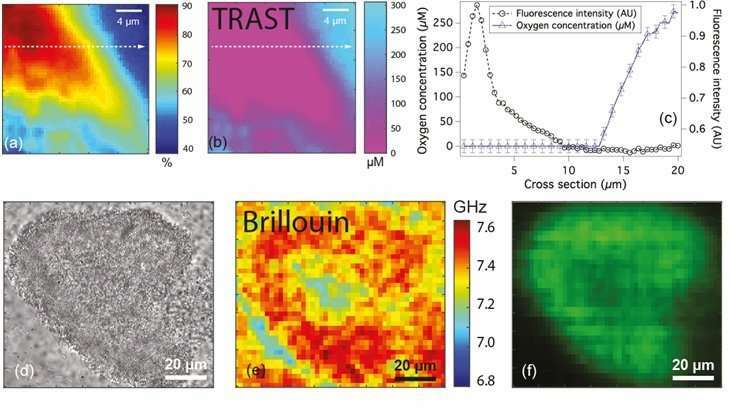 Brillouin microscopy enables the quantification of compressibility by measuring the shift in the frequency of incident light upon interaction with the biofilm. The compressibility of a material is the amount of stress needed to cause a change in the volume of a material. The compressibility of a material can be interpreted in terms of the stiffness of the material. Materials that exhibit larger frequency shifts are stiffer than those with smaller frequency shifts. This technique, which is "label free" (i.e. does not use any foreign molecule(s)), can potentially be used to understand the micromechanical properties of complex biofilms. Prof Wohland said, "Biofilms can have destructive effects, for example in wound infection or in the degradation of materials. However, they can also be harnessed for the production of biological materials or other processes. Both applications need a good understanding of the physical and physiological properties of biofilms. Therefore, new tools, as our team has developed, are needed to better characterise biofilms in their natural surroundings."